CLIENT: A brand anyone with Internet access would know. Really. In short: Transitioning the client from a sales approach to an educational one. 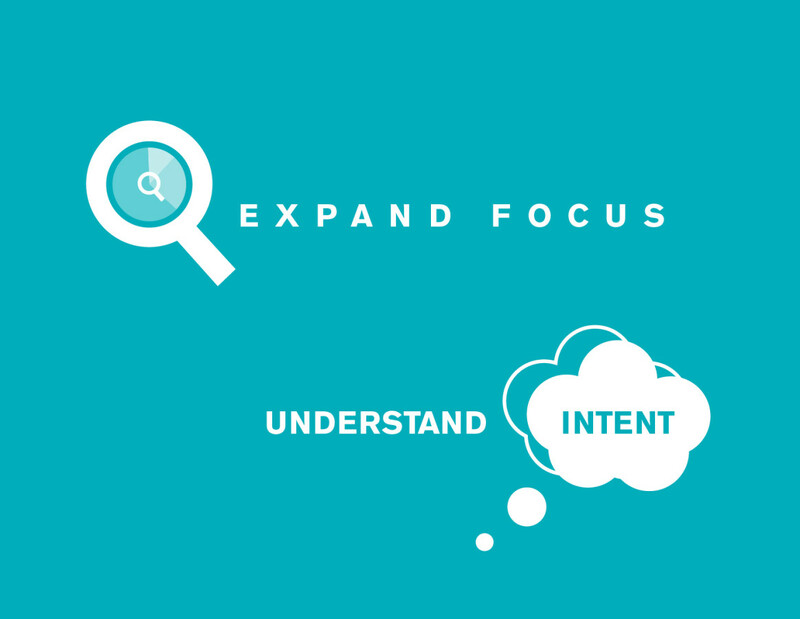 In any SEO strategy, it’s tempting to overload existing marketing content with keywords, cross your fingers, and hope for the best. But after evaluating how Google ranked top pages for “cloud computing,” we discovered the top-ranking pages were those that were the most audience-focused. These were pages made for some of the most essential, utilitarian searches, boiled all the way down to “What is cloud computing?”. Convincing the client to think of themselves as less of a merchant and more as a teacher – especially given their page’s success internally as a marketing tool – was a tough hill to climb. To boot, we found competitors didn’t stop at one page – one “lesson plan.” Taking a big-picture approach, they buttressed their landing pages with even more educational content that all linked back to their target URL, setting up a sound internal linking strategy and, yes, boosting their Google ranking. If competitors can do this, we thought, then surely THE thought leader in cloud-computing can do it even better. 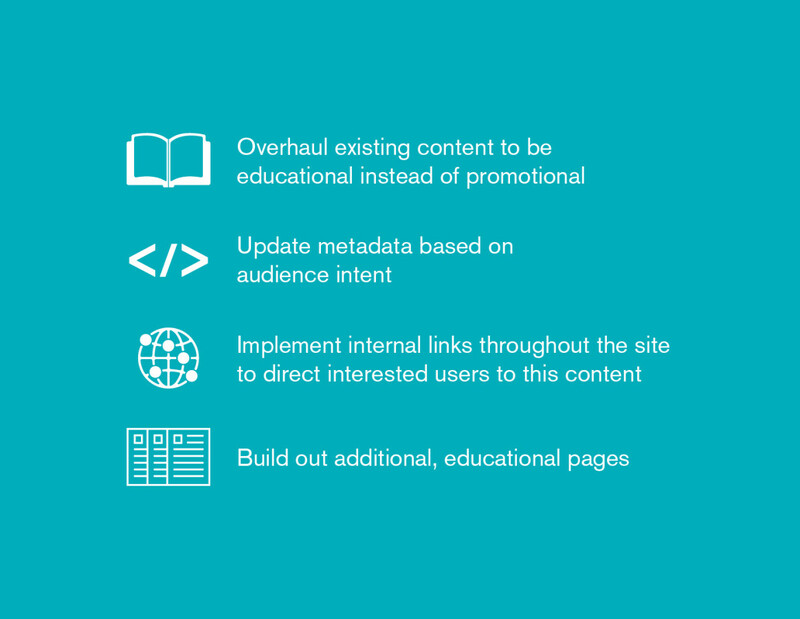 Our approach was to understand the target audience for Page One; to research what kind of education users were craving based on common content themes; to create a one-stop shop for users. It was clear to us the user approached the landing page with an eagerness to first know what cloud computing is — think: Cloud Computing 101. In which case, the landing page needed an overhaul – metadata included – if it was going to rank better for cloud-computing terms. The page needed to be digestible and tailored for the user who wants definitions and wikis, rather than outright seeking a vendor – to show them around the classroom before pointing to the admissions office. That page then needed a few supporting courses that furthered the cause of attaining a Page One ranking, addressing topics like “Types of Cloud Computing” and “Intro to Cloud Security” in the form of thoughtful content. And after that? Internal links all needed to unite behind our target URL. So, we got to work. We immediately went nose to the grindstone on tweaking metadata, conducting on-page audits and updating existing links for best internal linking practices. Though our client was initially hesitant about our plan to create additional content (and particularly sensitive about their brand portrayal – don’t worry, we get it), we built trust with — and delighted — the client when their year-over-year U.S. organic traffic increased by 413 percent within three months of our first round of changes. Confident in the direction we were headed, the client then gave the green light to use SERP analysis and Google Suggest research to build upon our progress with additional content, all revolving around trending cloud-computing subjects. Through a delicate back-and-forth with the client of revisions and suggestions, we introduced educational content pages that spoke to curious customers, and ultimately convinced Google the landing page was, in fact, the must-see educational page on the site. And thus – you guessed it – worthy of a top rank. Though rankings for top terms don’t happen overnight, the page earned a 413% YoY US organic traffic increase, from 39K to 201.5K within 3 months of the changes. Beyond that, the number of linking domains dramatically increased to the page, helping build authority and increasing referral traffic to the site. The creation of supporting content took a bit more time to achieve—almost 4 months to go live. Using the content outline developed by Seer, content was created that supported keywords such as: “Types of Cloud Computing” and “Intro to Cloud Security.” By July 2015, 14 months after we started on this journey together, our client hit page 1 and would eventually become the number one ranking vendor. Our target URL saw 46% YoY growth in US organic traffic, from 669K to 979K visitors. Interested in seeing results like this yourself? Get in touch!